Cara Delevingne has been showing off her latest tattoo this week via her Instagram account. 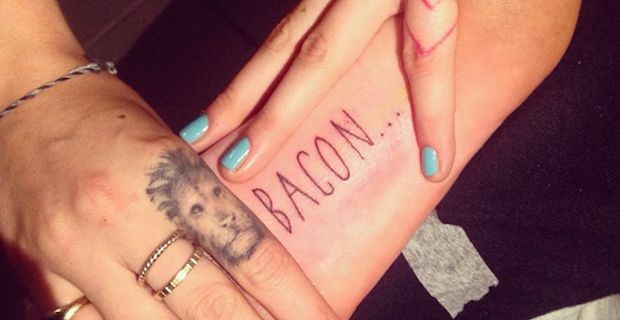 The model posted an image of her foot inked with the word "BACON..." in an homage to her favourite breakfast food. The model has made no secret of her love for fried bacon and she has made a habit recently of posting images of her favourite pork product to her Instagram and Vine feeds. This was logically the next step in her bacon series and she can now look forward to a lifetime of having bacon on her foot. Delevingne had some serious talent on hand too to tattoo on the word as she employed celebrity tattoo artist Keith 'Bang Bang' McCurdy to work his magic while on a trip to New York. Cara is a big tattoo fan and also has an image of a lion on one of her fingers, the word Silence on her wrist and a Made in England tattoo on the sole of her foot. Her love of bacon goes against all norms in the modelling industry by publicly proclaiming her love for a food which would be considered fattening and off limits to models in the majority of agencies. Delevingne's Instagram account is always good for a bit of entertainment too whether she is sharing her latest bacon escapades or otherwise.